ZisBoomBah is an innovative website that challenges conventional wisdom and develops tools to empower children and inspire parents to live a fun, active and healthy life. 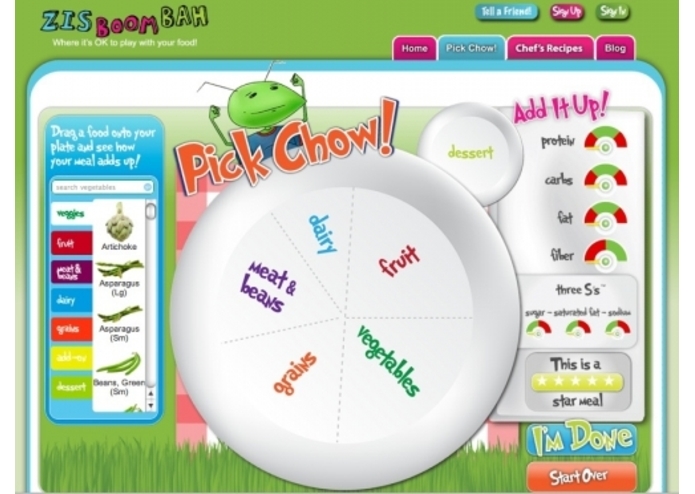 ZisBoomBah’s free online tool “Pick Chow!” allows children to create meals by dragging and dropping foods onto their virtual plate. The “Add it Up!” meters show the nutritional values in a fun and easy way and rates each meal with one to five stars – a feature that helps children learn quickly how their choices make a difference in creating a well-balanced meal. Children can send their “chow” to their parents, who then receive an email with what their child has chosen to be a healthy choice for breakfast, lunch and dinner, along with the menu, recipe, shopping list and coupons. Behind ZisBoomBah is a panel of health, nutrition and food experts and a team of experienced entrepreneurs who strive to ensure that the site’s content is sound and the recipes are as delicious for kids as they are nutritious.